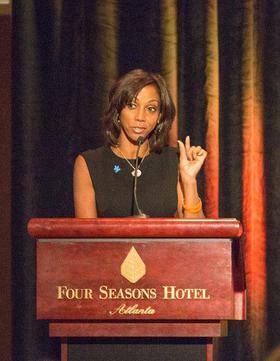 Actress, author, talk show host, and philanthropist Holly Robinson-Peete — an advocate for Autism and Parkinson’s disease — was the keynote speaker at the first annual Hope Flies Health Series presented by the Foundation for Mitochondrial Medicine held Thursday, November 8, 2012 the Four Seasons Hotel, Atlanta. Holly during her presentation at the Hope Flies Health Series on November 8, 2012. 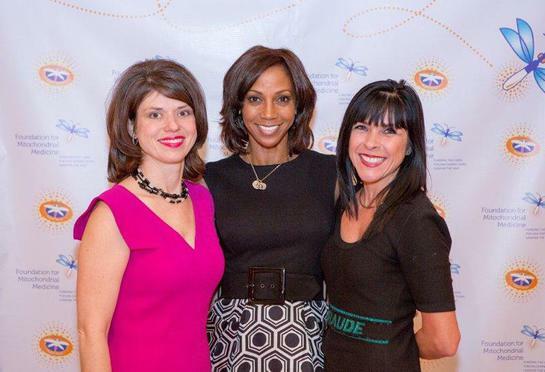 The event featured a talk by Ms. Robinson-Peete about her personal journey with her father’s Parkinson’s and her son’s Autism, and was followed by an expert clinical panel with speakers addressing Autism, Parkinson’s and the common connection the disorders share with mitochondrial disease. Clinical experts included Parkinson’s expert Dr. Zbigniew Wszolek of the Mayo Clinic; mitochondrial disease expert Dr. John Shoffner of Medical Neurogenetics Lab; Autism expert and author Dr. Martha Herbert, Assistant Professor of Neurology at Harvard Medical School and Pediatric Neurologist at the Massachusetts General Hospital in Boston; and Associate Provost and developmental neuropsychologist Robin Morris, PhD, of Georgia State University. Laura Stanley, Executive Director for the Foundation for Mitochondrial Medicine, said the program helped people understand the connection between mitochondrial disease and other related diseases. 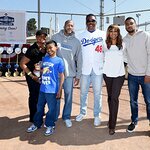 Ms. Robinson-Peete and her husband NFL quarterback Rodney Peete started The HollyRod Foundation to raise awareness and research dollars for both Autism and Parkinson’s disease. Ms. Peete recently joined the cast of the TV series Mike & Molly and was also an original co-host of the program The Talk. Her early TV career included starring roles in the successful series 21 Jump Street and Hangin’ With Mr. Cooper. For more information on the Foundation, please visit www.mitochondrialdiseases.org.